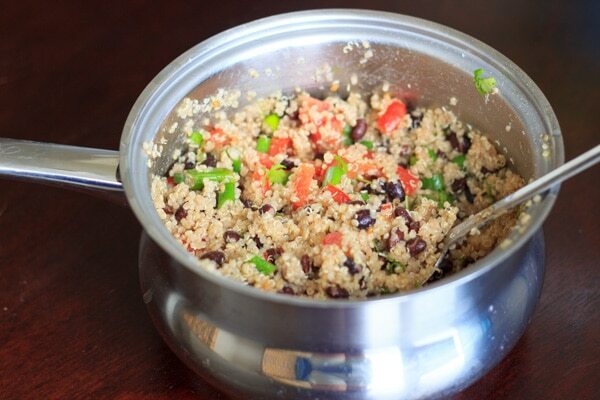 Black bean quinoa salad – flavorful, fast and filling. Another great way to enjoy quinoa in a vegan, gluten-free way. This was a hit for vegetarians and non-vegetarians alike! Recently, I had some family come to stay with me for the weekend. I made sure I checked off everything on my to-do list. I cleaned my apartment. Made sure I had enough clean towels. I prepared my cats for the fact that there was going to be company interrupting their nap-time. The important things. I already knew where I was taking them for dinner that night, but I *almost* forgot about the fact that they would be hungry when they arrived. I looked in my pantry to try to figure out what I could make quickly and that would feed 5 (very picky) people, and hiding behind a bag of pasta was quinoa! I’ve made quinoa burgers recently, but generally I tend to forget that quinoa is a great staple for quick and easy meals. I couldn’t make my Greek quinoa salad again because my several of my family members (shockingly) don’t like feta cheese. So I pulled out a can of black beans and figured I could make it work. All it took on top of that was a tomato, green onions, olive oil, lime juice, some herbs and spices to throw this together. My grandma couldn’t even pronounce the word quinoa when I put this in front of her, and I was worried she wouldn’t try it. She quickly got over her skepticism and repeatedly said how flavorful and filling this black bean quinoa salad was. At first, I wasn’t sure this was going to be enough to feed 5 people. But even after everyone had seconds there were still leftovers. It’s a good thing lunch was a hit, because my idea to make overnight french toast for the next morning had to be scrapped. Mainly because I forgot to buy bread! As my family pointed out to me, that’s kind of an important ingredient for french toast. Next time, I’ll spend more time making my to-do list. 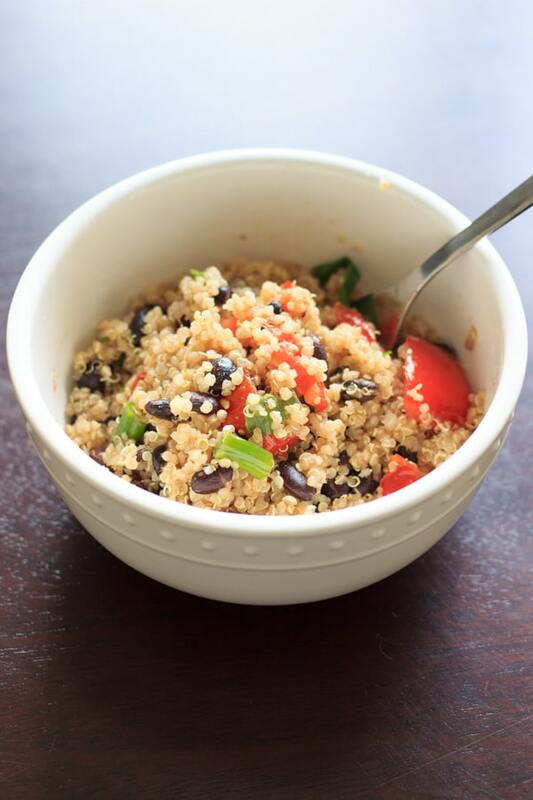 Black bean quinoa salad - flavorful, fast and filling. another great way to enjoy quinoa in a vegan, gluten-free way. This was a hit for vegetarians and non-vegetarians alike! In a medium-large saucepan, add quinoa and water and bring to a boil. Once water starts to boil, reduce to medium-low heat, cover, and let cook for 10-12 minutes or until water is absorbed. Remove from heat. Add the black beans, green onions, and tomato to the quinoa. Mix in olive oil, cilantro, cumin, and lime juice and stir thoroughly. Store in refrigerator until cold if desired, or serve immediately. This looks amazing! Love these kind of salads in the summer- so light, colourful and flavourful! 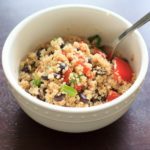 Quinoa salads are my favorite, and this one looks delicious! I love the addition of black beans and green onions! I’ll definitely have to try that! Thanks Gayle! Quinoa salads are quickly becoming one of my favorites, too! This black bean salad looks so delicious and I got the exact same pot!! Thanks Ami – You have good taste in cookware! Love this! 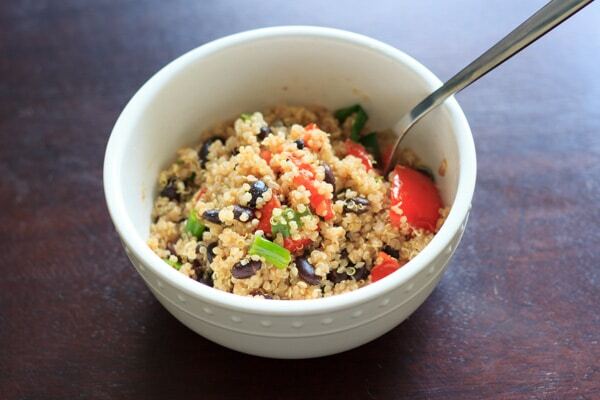 Black beans and quinoa, a match made in heaven! I hadn’t had quinoa until this year! Why can’t you eat it? Just came across your blog because your blog because you commented on mine (thank you) and I love it! Everything looks so yummy! I love a good quinoa recipe and definitely need to try this one! Tasty, and read a recent AARP online article about 14 superfoods and 4 are in this recipe (olive oil, black beans, tomatoes, quinua) of course the other ingredients are also good for you, so enjoy.